Lease to own this highly sought after Turnkey residence in the VUE. Available immediately. 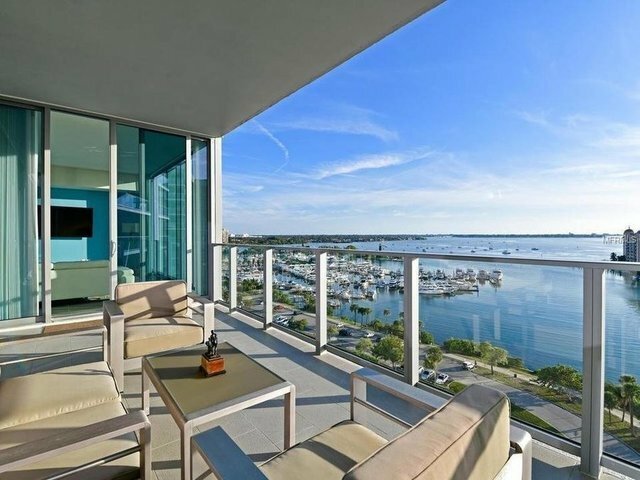 Enjoy panoramic Full views of the Bay, Gulf, Intercoastal, Marina and Fabulous downtown Sarasota vistas, from this phenomenal 11th floor condo. Featuring 2 bedrooms, 2.5 bathrooms, DEN and a semi private elevator. To describe it with one word, "NIRVANA". Featuring 10' floor-to-ceiling windows along the entire South and West facing sides of this residence with a 10' deep terrace overlooking the marina and every view known to man. Residence features; large open plan, including an Exotic Chef's kitchen that features a Delicatus Granite waterfall island, superior top of the line stainless steel Jenn Air appliances, smashing backsplash, and it all opens to an inviting dining and family room built for entertaining. The spacious owner's suite with large walk in custom closet, double marble vanity and walk-in shower with frameless-glass. Complete with Two assigned parking spaces under cover. Perfect downtown waterfront location, 24-hour concierge, valet parking, pool, spa and fitness area, large lobby and gatherings for residents. Very pet friendly, up to 2 pets can enjoy the over 8,000 sq foot rooftop dog park. WOW! Located adjacent to the new Westin Hotel and the close by Ritz Carlton. Enjoy Sarasota's best kept secrets, stroll, dine, view sunsets, shop, boat and enjoy cultural events are all waiting for you at THE VUE. Make sure you check the link for an incredible cinematic tour!